Say what you like about Kev but that "lad" retains the use of his eyes. On the bus home to Felixstowe, he said, somewhere in Kirton, I saw a cafe sign. Mentioned the word "artisan", maybe. That, I both thought and said, seems highly implausbile. Mr Google, as usual, put me straight and directed me stroke us to the Artisan Smokehouse. Not in Felixstowe, not even in Kirton, but in faintly fictional Falkenham. First new business in the village for 100 years, commented a local lady who'd popped in for a cheeky glass of white. Me and Andy paid a highly enjoyable visit the next day, vowed not to tell Kev, promptly told Kev, and then the three amigos did a proper trip. Friday, 1pm, and all half-a-dozen car parking spots are occupied. Other folk must be aware. cheese board inc Morbier, Brie, truffled Gouda, etc. Getting the picture? That smoked duck, BTW, has just won first prize in a national charcuterie competition. Pastrami and salami sarnies for them, "music bread" (carta di musica) with pesto for me. Top tastes and dished up with a friendly smile and some Curiosity Cola, all while watching a squirrel scurry along the fence. 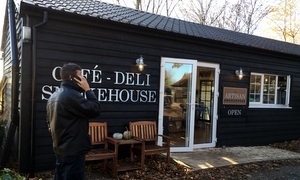 Here in the Goose Barn, they'll also rustle you up a luxury hamper for your foodie pals. Essentially this is a cooler and less eyepoppingly expensive version of Emmett's. Isn't really time for coffee but has to be done. That's not half bad, too, courtesy of a roast from the Firestation. Gorgeous black cherry and almond slice alongside, plus, with Kev's black coffee, a "little urn" of milk. Note that at the time of writing, the cafe part is only open Thursday, Friday and Saturday. In summary, this smokehouse is on fire. If it was a car -- Alfa Romeo Giulia. If they were passing by -- Tom Hughes.